Between fantasy and illusion, Fantillusion immerses you in a shower of glittering light, beautiful music and dazzling special effects. The parade currently enters from "it's a small world" and leaves at Town Square on Main Street, so plan your position accordingly! During Summer 2007, the parade's trademark show stops have been altered to speed the performance. For this season at least, there is no longer anywhere on the route where all 3 stops can be seen, and the information below is, for this season at least, no longer applicable. You should find a place to watch at least 25 mins in advance, or even earlier (anything up to 1 hour!) should you want a prime location on Main Street/Central Plaza. Remember, Candleabration and Wishes are performed right after the parade, so if you'd like to also get a good view of these, find a spot early on Central Plaza. Whilst videos of Fantillusion usually present it in all its glory, still photographs are very difficult due to the thousands of moving lights. Unless you've some good photography knowledge, it might be best to just enjoy the magic! 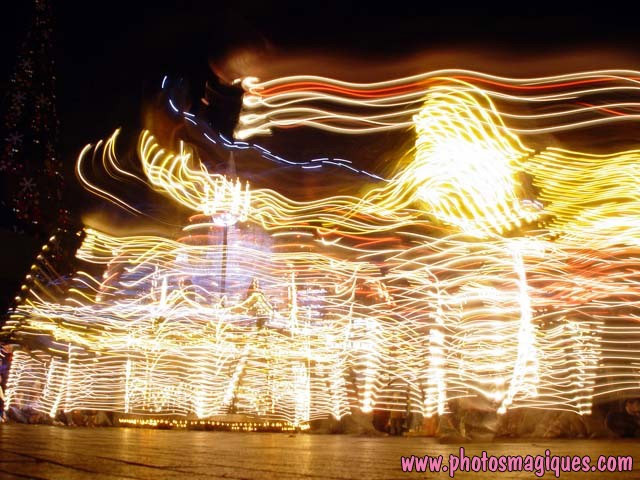 Flash photography - though used by countless guests - will almost certainly provide unmagical photos. Staying for several nights? Why not skip Fantillusion one night? This is a great time to ride popular attractions with shorter queues! Remember, though, the Parade Route cuts the park in half, so choose your side first! It's a rainbow of colour! 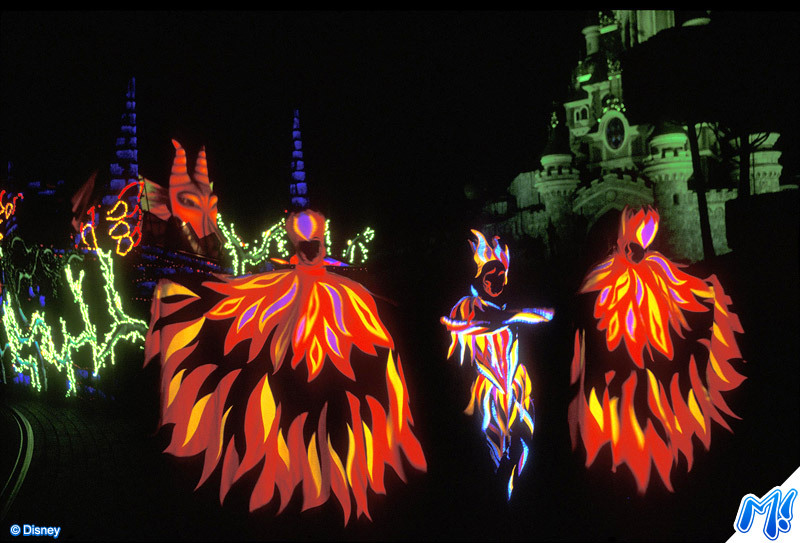 Disney's Fantillusion brings the classic story of good versus evil to life in three glorious acts featuring your favourite Disney characters and thousands of beautiful lights. 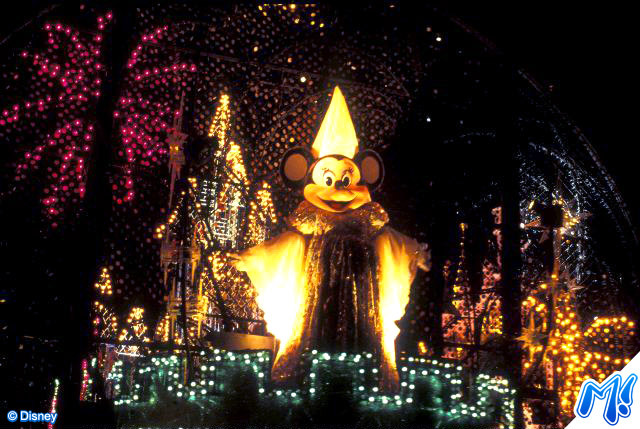 The show begins with Mickey Mouse himself on a dazzling float covered in multicoloured lights, as he wishes upon a star for the gift of Disney light. His wish is answered and the parade route sparkles with fantasy and Mickey's magical enchanted garden follows him along with beautiful plant life and elegant butterflies. Flora, Fauna and Merryweather continue to spread the Disney magic through the garden and make dreams come true for everyone. But, before long, blackness looms on the horizon. The Disney Villains have arrived, and they're about to immerse you in their frightful world of darkness! Mickey's gift of Disney light fizzles out as Maleficent, Jafar and Ursula overpower the magic with their forces of evil and use all their deadliest tricks to rule the night. Just as you thought there was no end to the darkness, the Disney Princes and Princesses wish and dream with all their ight to turn the darkness back into light! Once again the parade route glistens with magic and fantasy and the royal heroes and heroines celebrate with an unforgettable ballroom finale. 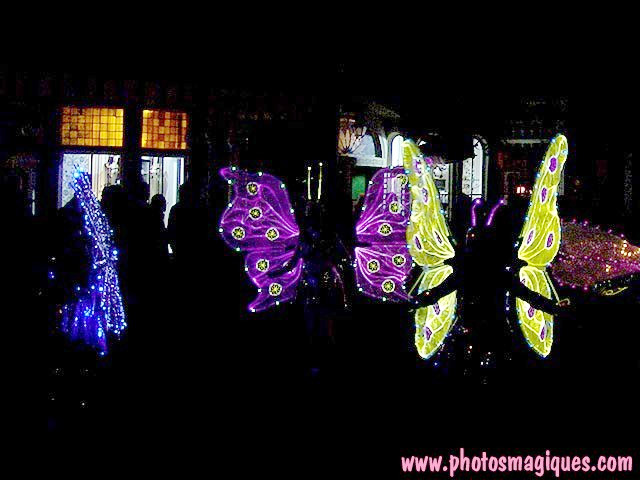 In bursts of colour and light, they float up into the magical night and perform a beautiful romantic dance right before your eyes! As the Princes and Princesses move on, Minnie provides a grand finale of glimmering, shimmering light and fantillusion 'fireworks'! 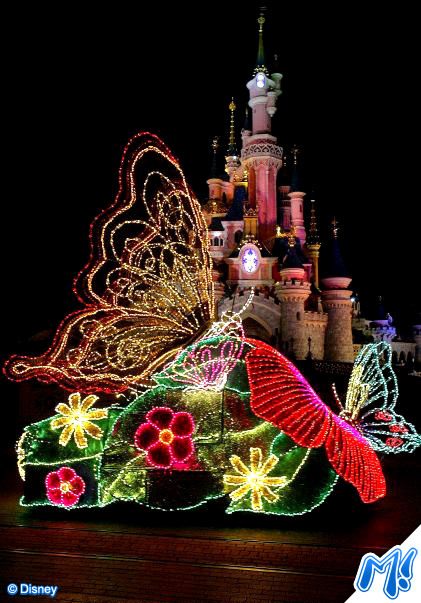 Mickey begins the show with a magical multicoloured glittering float, from which he manipulates the "Disney Light" to create the shimmering Magical Garden which follows behind him. As Mickey stops the parade, an explosion of light brings with it the arrival of Goofy, Pluto and more of your Disney friends, all joining in the magic! The parade begins with a dazzling rainbow of colour, as Mickey arrives in style on a sparkling flowery float, to cast the magic of the Disney light into the night! A colourful Gazebo in Mickey's Magical Garden moves magically along the parade route before stopping to present Goofy, Pluto and all the classic Disney characters. The three enchanting garden fairies themselves, Flora, Fauna and Merryweather, enjoy the delights of the glittering garden carousel and its gathering of lights. The Disney Villains capture the Disney light and turn everything to evil! They plunge you into their world of darkness as they try to take over the show and capture the Disney magic! As they stop to capture the magic, glittering lights and ominous music heralds their transformation into their monstrous alter egos! Maleficent cackles at the edge of the bewitched castle covered in vines, before magically transforming herself into a spectacular fire-breathing dragon. Jafar's Arabian temple glows wicked shades of colour as he hypnotises the crowd before, right on cue, he morphs into a monstrous serpent with a very sharp bite! Ursula's sea snakes pull her through the ocean of darkness, before the sea monster herself appears and rises high above you with a gurgling cackle of discontent. Keep a dream in your heart and wish with all your might - here come the heroic Disney Princes and Princesses to save the day! The parade finishes with a truly magical fairytale celebration, as the royal guests rise high into the air and dance to memorable music from their classic films as glittering lights fill the air, before Minnie ends the show with an unforgettable Princess finale! Snow White and her handsome Prince lead to way in restoring the magical Disney light and spreading a new wave of enchantment and magic along the parade route. A lavish ocean-inspired float from Under the Sea with bright colours of pink, yellow and green brings more magical memories and twinkling lights. The intricate beauty of this classic fairytale comes to life in thousands of twinkling lights, with Belle and her Beast celebrating the night being turned back into light. Soaring high above the glittering rooftops of Agrabah, Aladdin takes Jasmine on a romantic, swooping, Magic Carpet ride during the ballroom parade stop sequence. A stunning castle of brilliant lights and stunning grandeur hides a magical fairytale finale, as Minnie ends the parade with bright bursts of Fantillusion fireworks! The music for Disney's Fantillusion in Paris is ultimately the same as it was when the parade was performed in Tokyo, although obvious differences are the removal of the voices of characters which don't feature in the Paris version and the addition of a new multilingual introduction spiel. The music was composed and produced by Bruce Healey, whose other Disney credits include "Fantasmic!" and "One Man's Dream". The small changes made to the music for Paris were done by Vasile Sirli, Disneyland Resort Paris' own musical director. 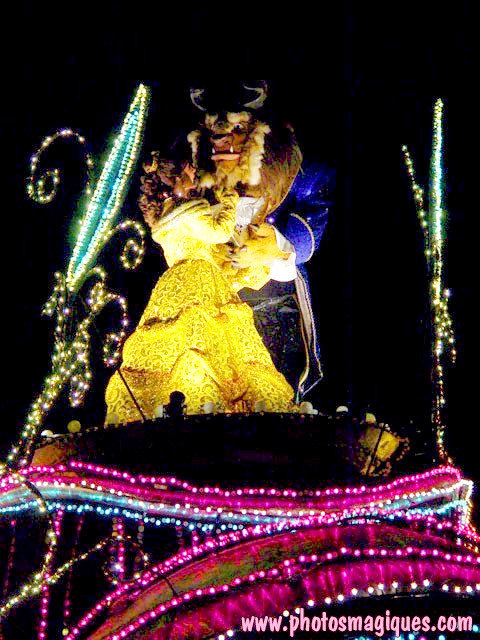 The music features a distinct "Fantillusion Theme" which is then altered for the different acts of the parade. For the Disney Villains section it becomes darker and more menacing, whereas for the Happy Ending it gets a royal Princesses feel to it. This is helped by the use of well-known movie themes mixed into the music, such as "Prince Ali" for Jafar and "Someday My Prince Will Come" for Snow White. The parade stops also feature some delightful music, with the "Mickey Mouse March" for the Mickey's Magical Garden stop and various Princess songs for the Happy Ending ballroom dancing stop. The music for the three different acts of the parade and the three parade stops is synchronised by a highly sophisticated computerised system and talented teams of Cast Members. The position of every single float is known throughout the parade thanks to sensors in the ground and on the floats, with a signal sent from a transmitter subsequently keeping the music for each float in perfect synchronisation. 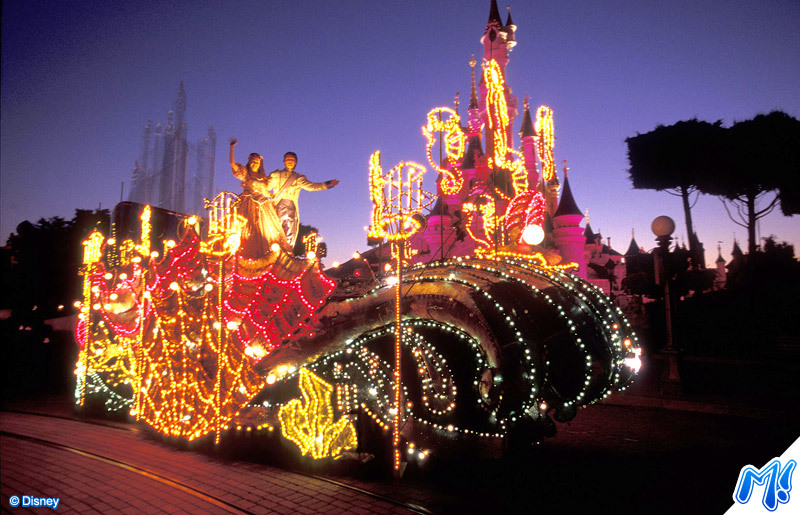 The full soundtrack of the parade has never been released in its entirety by Disneyland Resort Paris, even though a full soundtrack CD was a hugely popular release in Tokyo Disneyland during the parade's initial Japanese run. Disney's Fantillusion existed long before it premiered in Paris, many many miles away... in Tokyo! 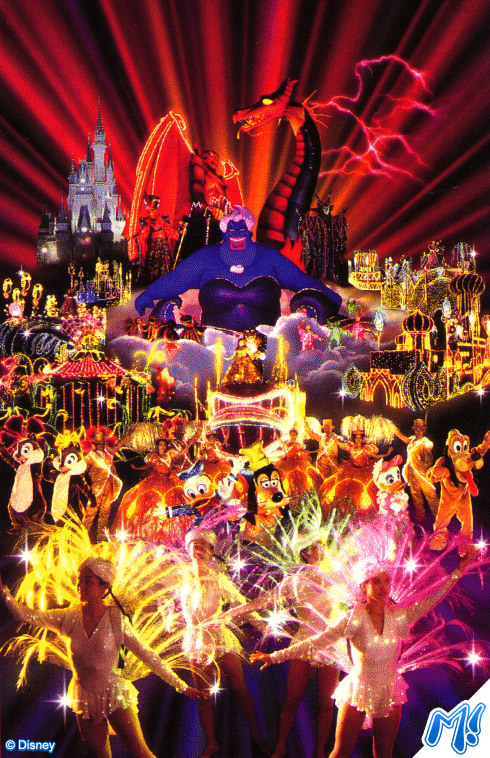 When Disney Fantillusion premiered at Tokyo Disneyland on July 21st 1995, it was not just a new light parade, it was a magical mix of light, music, special effects and Disney characters to create an experience that took Disney parades to a new level. 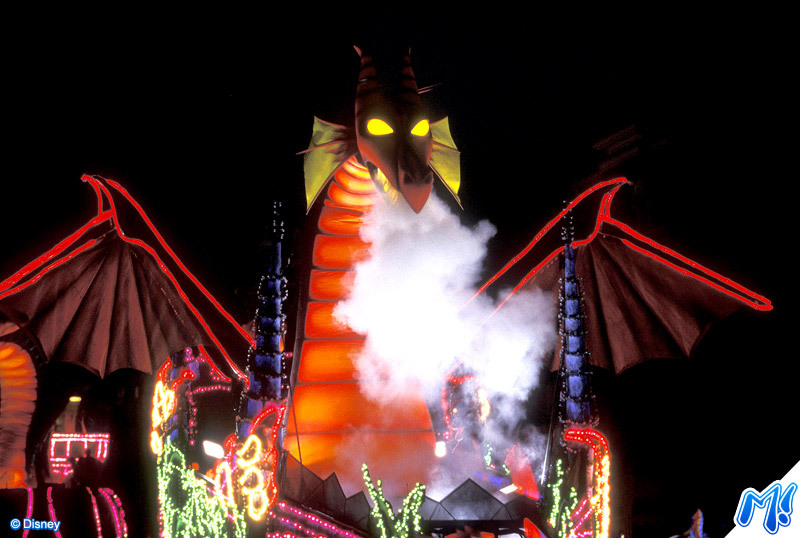 Since Tokyo Disneyland didn't have the lagoon or space required for the popular "Fantasmic" show of the American resorts, Fantillusion was designed as a parade version of this night-time good versus evil spectacular. 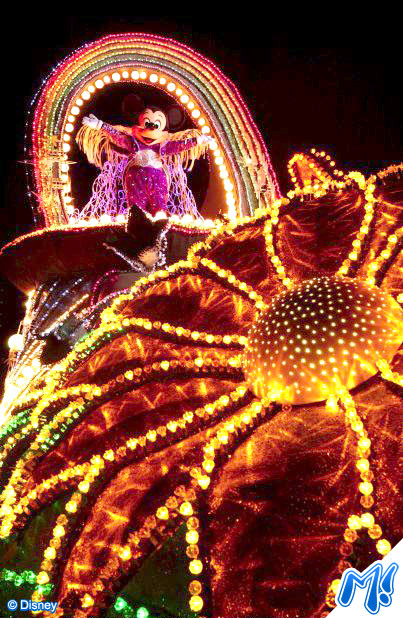 The 31 major floats each formed part of the overlying story of Disney good vs. Disney evil, and over the parade's seven years in Tokyo it gained many fans who were sad to see it leave at the end of its "Sayonara Fantillusion!" season on May 17th 2001. After the parade finished, the floats which had been bought by Disneyland Resort Paris were packed up ready to be transported, and those which had not been bought were rumoured to have been destroyed. 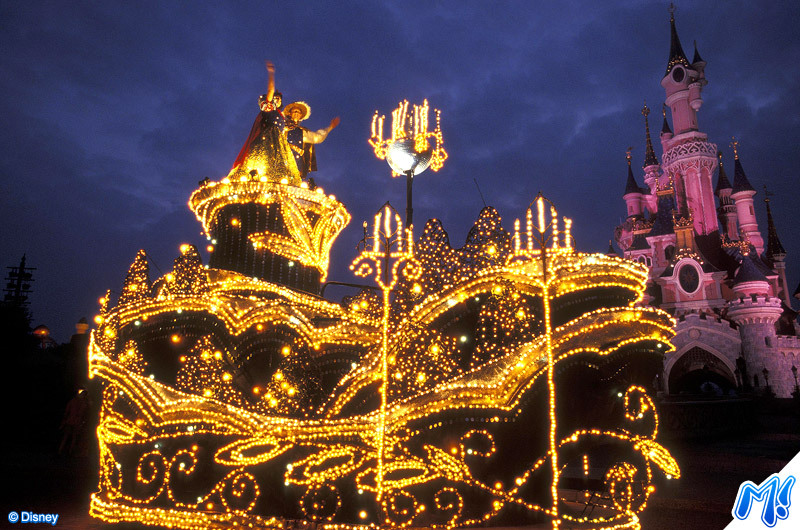 Of the 31 major floats in the Tokyo version of the parade, Disneyland Resort Paris only bought under 15. Thirteen floats are currently used in the parade, but there are rumours that Disneyland Resort Paris has a couple more in storage and might add them to the parade at some point, though so far this is seeming more and more unlikely. 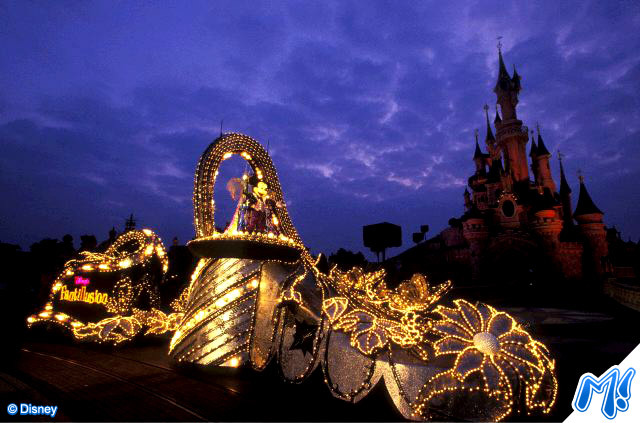 It took the Fantillusion parade floats more than 40 days to get to Disneyland Resort Paris from Tokyo Disney Resort. They travelled by cargo ship from Japan to Australia then set off again through the Panama canal and Mediterranean Sea before finally travelling around Spain and up the west coast of France to reach Northern France. They were then taken by truck to Disneyland Resort Paris where they were completely refurbished. This refurbishment of the parade floats took much longer than expected because some of the floats were very badly damaged in transit. This meant that Disneyland Resort Paris had to repair many of the floats aswell as convert their electrical system to the one used in Paris. 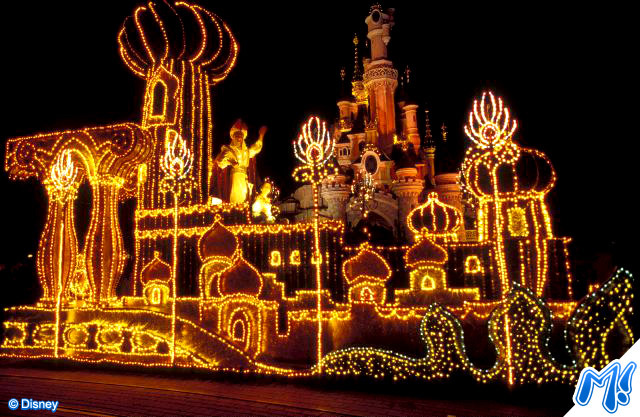 Disney's Fantillusion was due to begin in Paris in 2002, when the Main Street Electrical Parade would have been running for ten years, but instead because of the problems with the floats and the fact that Disneyland Resort Paris still wanted the emphasis on their newly opened Walt Disney Studios Park, Fantillusion had to wait another whole year for its Parisian debut. 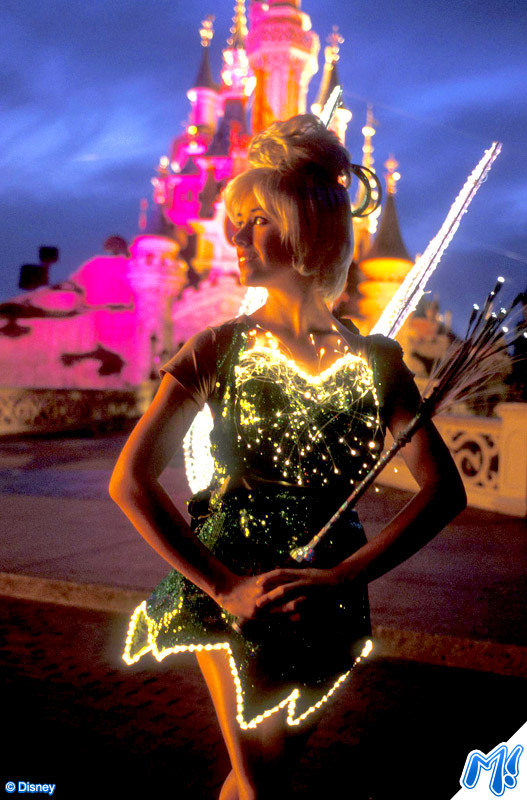 After many weeks of rumours about Fantillusion parade rehearsing in Disneyland Park after hours, there was a special Fantillusion preview night on June 28th 2004 for Annual Passport holders. 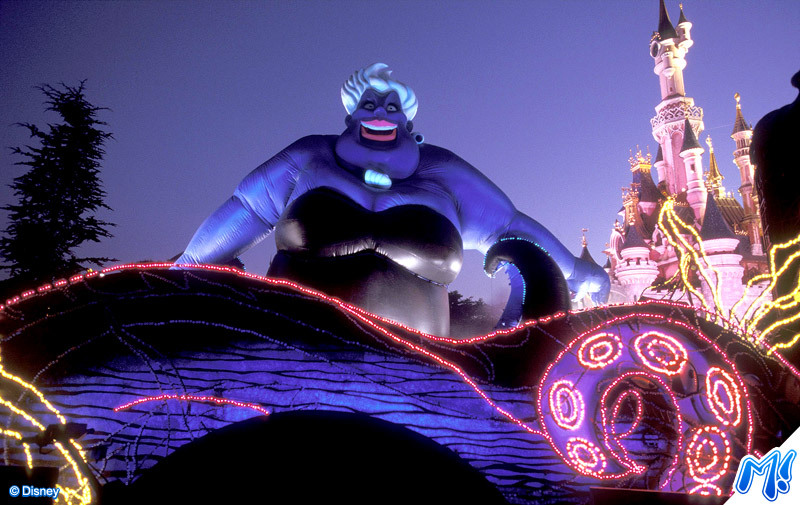 The parade then premiered to the public at the start of its first summer season in Paris on July 5th 2003, running until August 31st. Fantillusion returned for its first Christmas season in the resort from November 8th to January 4th, and has been playing to crowds of adoring fans every Summer and Christmas season since. 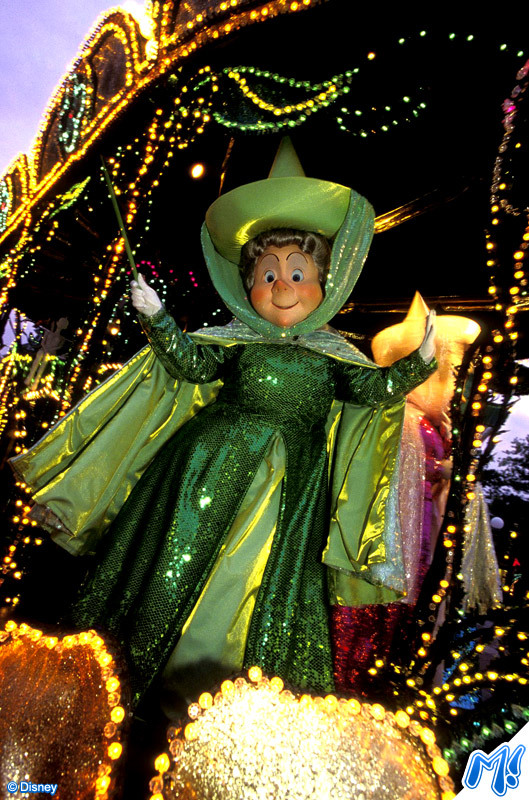 In Summer 2005, the "Dark Forest" float was removed from the parade in response to budget cuts and guest feedback. As the only villain float with no character or transformation effects, the float was no longer seen as an important part of the parade. Disney's Christmas Season in 2005 brought a further change to the parade, with the parade now running from It's A Small World to Town Square. Whilst this brought with it a huge amount of technical troubles in the days after the switch, it allowed for better efficiency with the backstage parade preparation and meant guests would now follow the parade to the park's exit instead of back into the park. 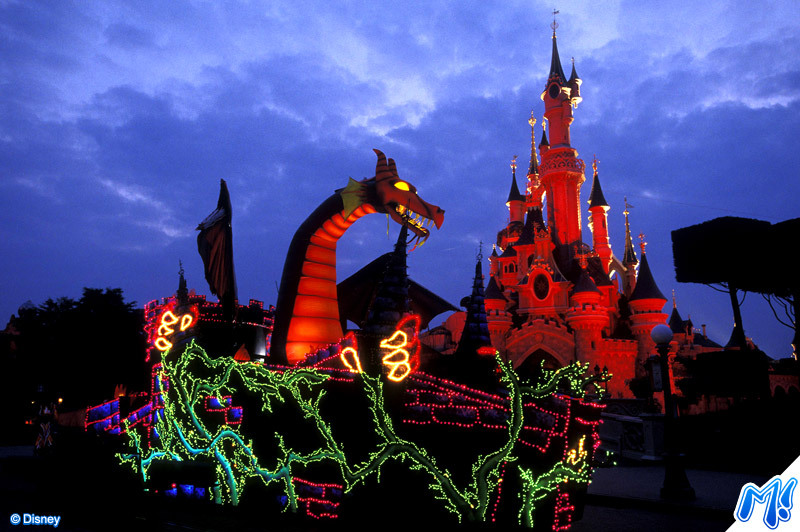 Disney's Fantillusion has become a firm favourite at Disneyland Park, one of the memorable highlights of many guests' visit, thanks to its magical blend of beautiful music, beloved characters and incredible lights, creating memories that last forever. Disney Company, Euro Disney Associés S.C.A., Disney Enterprises, Inc. or their subsidiaries and affiliates.